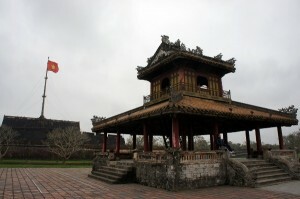 The imperial city of Hue, Vietnam. Absolutely breathtaking. 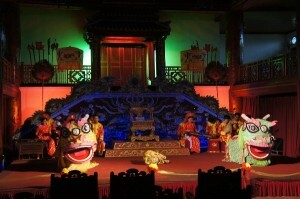 Inside the city of Hue is the forbidden city. It was a short stroll from our hostel so we decided to hoof it. The entrance to the forbidden city was grand. We were impressed before we even stepped foot into the city. 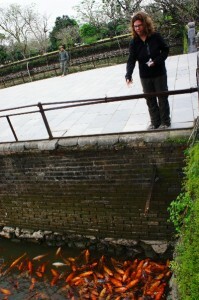 The fields inside the forbidden city walls were an epicenter of activity. We saw college students playing soccer and a guy practicing kung fu. 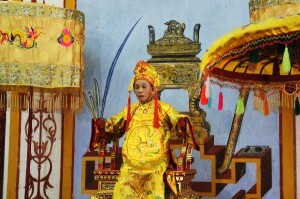 The forbidden city was almost entirely destroyed during the Vietnam War. The remaining buildings and rubble were not that impressive compared to the rest of the architecture in Vietnam and Hue in particular. But we decided to give the city a chance. 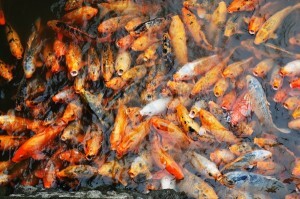 There were huge ponds full of Koi fish. For a couple of cents you could buy bread to feed the fish. We bought a bunch and the fish went crazy! The highlight of an hour of walking around the rubble was this chinese tourist. He was dressed up in a robe and walking around. He was hysterical. I don’t think he was trying to be funny, but just his expressions and mannerisms made me crack up. 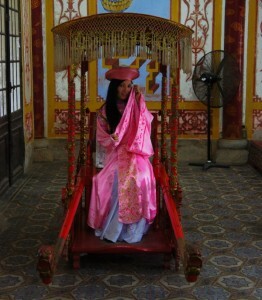 There was also a lady dressed up in traditional royalty attire, she posed for a picture. We happened to stumble upon the start of a live theater performance. 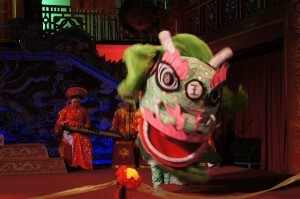 The theatrical act started with a dragon dance. The dragons bounced up and down, then attacked each other. I wasn’t entirely sure what was happening to be honest. But it was entertaining. Ladies came on stage with large fans. They moved in fluid unison; it made the illusion of one large fan sweeping the entire stage. 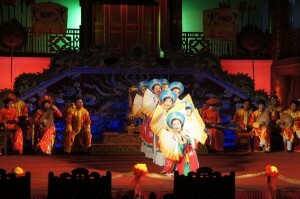 The final performance was a lotus flower dance. 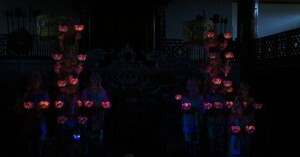 At least 20 dancers filled the stage with illuminated lotus blossoms. They flowed around the stage to a slow, trance like rhythm before exploding in a fiery of movement. Simultaneously and abruptly the chaos stopped. They formed into human pyramids in the shape of lotus flowers. All the flower illumination was done with candles! And no candles went out for the entire performance! Not during the chaotic frenzy on stage or even as they climbed up into their formations. Monks in Vietnam, at least these monks, are vegetarian. So they don’t fish. 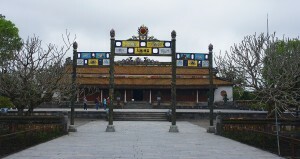 Their monastery is surrounded by a lake. 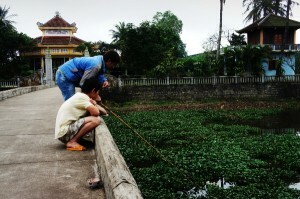 We caught these fishermen trying to steal some fish while the monks were having lunch. I assume fishing is great by the monastery, since the monks try to prevent fishing there.